Tsugaru shamisen 津軽三味線 has had a resounding impact on the Japanese musical soundscape over the last few decades. It has been transformed from a regional folk music genre to one of national and international popularity with traditional and modern styles.1 The term Tsugaru shamisen (or Tsugaru jamisen) refers to both a type of shamisen (three-string, long-neck, fretless lute) and the music played by this particular type of Japanese traditional instrument.2 As a style of music, Tsugaru shamisen developed in the district of Tsugaru in the west of present-day Aomori Prefecture 青森県 at the far north of the island of Honshu. The Tsugaru district is the historic and geographic home of this style of music, even though it has become increasingly popular throughout Japan and beyond in the present day. Historically, the Tsugaru district was, and to a certain extent still is, a relatively isolated Japanese peripheral region that developed its own local dialect (referred to as Tsugaru-ben 津軽弁, and cultural traits. Tsugaru shamisen (the music and the instrument) is a legacy of the district's historical, geographic and cultural place in Japan (cf. Stokes 1994). There are several types of shamisen used in traditional Japanese music, but the performance-practice of Tsugaru shamisen is notably different. The player does not kneel, but sits on a chair and plays in a way that often creates a percussive sound as the spatula-plectrum strikes the dog-skin cover of the sound box immediately after playing a string.3 Modern-day classification usually groups three main types of shamisen based on the size of the instrument's neck: futozao 太棹, thick neck), chûzao 中棹, medium neck) and hosozao 細棹, thin neck). While historically there was not a specific type of shamisen associated with the Tsugaru district, today the Tsugaru shamisen belongs to the futozao type and has its own unique features (see Kinoshita 2003). Of particular significance are its very thick neck, a metal screw known as azuma zawari 東ザワリ that is attached through the neck at the end away from the player and causes the lowest string to vibrate, and the thick dog skin that covers its sound box. What is particularly striking about Tsugaru shamisen as a style of Japanese music is that it has a relatively recent history. Tsugaru shamisen is a relatively recent addition to Japanese traditional music, and its more modern crossover styles contribute to an ever-increasing range of popularized music styles that use traditional Japanese musical instruments. To use the terminology of Hobsbawn and Ranger (1983), it is a recently invented tradition. In other words, it is perceived as traditional, but is a relatively recent tradition. Indeed, the term Tsugaru shamisen does not appear in the Edo period (1600-1868) or the Meiji (1868-1912) and Taisho (1912-1926) eras, and only began to be used in the 1950s and 1960s (Suda, Daijô and Rausch 1998:19). It is only since World War II that this music style has gradually become widely recognized as a distinct, popular and influential regional style of Japanese folk music. Moreover, this local style of music has in more recent years been transformed to national and even international status to become one of Japan's most popular and well-known forms of music, both as a traditional folk music and, since about 1975, as a more modern or hybrid style (i.e. in crossover music), which includes improvised and virtuoso solos that are somewhat reminiscent of a lead guitar break in rock music. The roots of Tsugaru shamisen are sometimes linked to a player called Nitabô 仁太坊, 1857-1928, real name AKIMOTO Nitarô 秋元仁太郎, a legendary figure who was a bosama 坊さま, a blind itinerant shamisen player). Nitabô was born in Kanagi 金木 village in the North-Tsugaru district and was a hoido ホイド, beggar), part of a community of musician beggars who were looked down upon because they were poor. As a way of remembering the influence of Nitabô in the development of Tsugaru shamisen, a monument was built at the Kawakura Jizôson 川倉地蔵尊 temple near Kanagi in 1988 and another near Kanda bridge 神田橋 in 1993. 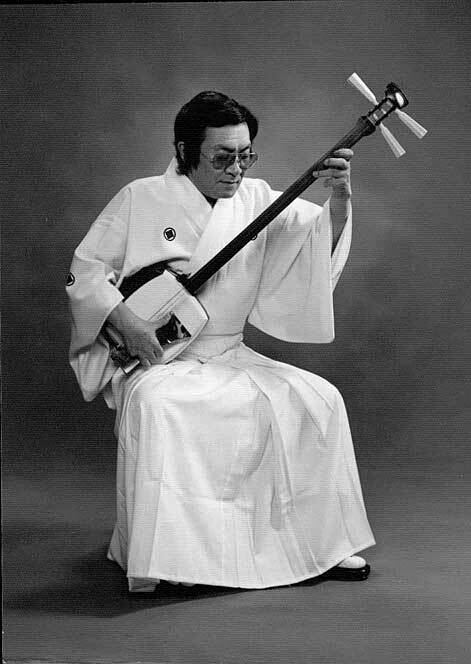 Besides Nitabô, other historical and influential figures in the development of Tsugaru shamisen include TAKAHASHI Chikuzan 高橋竹山, 1910-98, real name TAKAHASHI Sadazô 高橋定蔵,4 KIDA Rinshôei 木田林松栄 (1911-79, real name TANAKA Rinjirô 田中林次郎), SHIRAKAWA Gunpachirô 白川軍八郎 (1909-62) and Fukushi Masakatsu 福士政勝 (1913-69, real name Fukushi Masao 福士まさお). More recently, players such as YAMADA Chisato 山田千里 (1931-2003) have been particularly influential in popularizing Tsugaru shamisen in Japan and internationally too (see Matsuyama 1996). and AGATSUMA Hiromitsu 上妻宏光 (b. 1973), or simply Agatsuma, and KINOSHITA Shin'ichi 木下伸市 (b. 1965).5 Furthermore, some contemporary styles of Tsugaru shamisen music even use synthesizer backing and include a range of eclecticism as a style of contemporary popular music rather than folk music. Some of its current younger players even have a type of teenage idol status with designer clothes and dyed hair. In the early to mid-twentieth century, some Tsugaru shamisen players were sponsored by large organizations, especially regional newspapers such as Tôô Nippô 東奥日報. As the Tsugaru district was at that time still a very remote part of Japan, Tsugaru shamisen performers had to travel to the capital, Tokyo, to work with record companies (see Groemer 1991). The great difficulty of the Tsugaru folk songs made them extremely popular among amateur min'yô 民謡 (Japanese folk song) singers because a successful performance would gain them valuable points at min'yô contests, and this resulted in turn in a popularization of the accompanying instrument, the Tsugaru shamisen. The idea of nostalgic regionalism (cf. Buell 1994:40-71) was further responsible for the developing popularity of Tsugaru folk songs in the minds of audiences outside the Tsugaru district, where notions of nostalgia for a home town (furusato 故郷) were embodied in the lyrics, which at the time of increased nationalism leading up to World War II allowed the songs to have particular significance to a wider Japanese public. There are today around 50,000 Tsugaru shamisen players. They belong to about 20 "schools" dedicated to the playing of this particular style of music (Suda, Daijô and Rausch 1998:11). The importance of the Tsugaru district to these players is today still very present in their performance activities, even with the wider national and international dissemination of the music style. While the players exist within a type of imagined community (cf. Anderson 1991), they are still drawn to the Tsugaru district due to its importance as the home of this genre. Rausch (2001:65) has noted that in 1999 the Tsugaru Shamisen Summit Hirosaki, organized by the Tsugaru Shamisen National Association, attracted around 500 players from "approximately 94 groups practicing Tsugaru shamisen from Hokkaido to Kyushu." Today, Tsugaru shamisen has importance across a range of social and cultural spheres. It is indeed a product of intense local significance to the people of the Tsugaru district; it is a style of music that has established itself as a major contemporary form of traditional and new traditional Japanese music; and it crosses national boundaries in a world of contemporary cultural flows where from the 1960s and 1970s it is increasingly found as a representative example of Japanese music at international festivals, among touring musicians, and in terms of its popularity among non-Japanese musicians, scholars and consumers of the style of music now referred to as world music. In this sense, Tsugaru shamisen is a translocal genre, a national genre, and a regional genre whose roots are found in the Tsugaru district, a peripheral regional that has now found a place in modern Japan. The ethnoscape of Tsugaru shamisen, to use the terminology of Appadurai (1990:295), is such that this modern-day form of traditional Japanese music is found in a multi-regional, multicultural Japan; its music originated among the farmers of Tsugaru and was popularized by blind, itinerant beggars, but has now been transformed and popularized by a new generation of younger players and listeners; and the music has now even found a place in the international sphere of contemporary world music. In Hirosaki 弘前, a city in the Tsugaru district, there are two live houses dedicated entirely to the performance of Tsugaru shamisen (one was run by Yamada Chisato from the 1950s until his death). The local tourist office even holds weekly performances of this style of music, perhaps as a representation of an icon that helps in the construction of local identity, and the local Catholic Church has stained-glass windows showing the instrument alongside images of apples, a major icon of economic importance to the region. In the city of Aomori, the capital city of Aomori Prefecture, the Prefectural Center for Local Products and Tourism (ASPAM), which is housed in a fifteen-story triangular building, has daily cultural shows of Tsugaru shamisen that showcase the genre, the instrument and its players. Also, in Kanagi town and across from the Dazai Osamu Memorial Hall 太宰治記念館 (a local museum dedicated to the memory of this local writer who lived from 1909 to 1948), is the Tsugaru Shamisen Kaikan 津軽三味線会館 (Tsugaru Shamisen Hall), which was built in 2000. It has a small room with various types of shamisen on display behind glass and a small concert hall with regular performances. Outside, buses of tourists fill the car park as they visit this local tourist attraction. For 40 years or so, YAMADA Chisato 山田千里 was one of the driving forces behind the popularity of the Tsugaru shamisen. Not only was he a brilliant performer in his own right, it is probably no exaggeration to say that he was also single-handedly responsible for the recent boom of the instrument and its music among the younger generation. 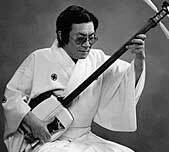 It is even less of an exaggeration to say that he more than anyone else has kept the Tsugaru shamisen alive. For decades he ran a live house, "Yama'uta" 山唄, at a stone's throw from Hirosaki Station, where he taught his students, young and old, and gave them the opportunity to earn their keep serving food and drinks to his guests. Most of them started as raw amateurs, but some of them are now close to the top of their trade. Many of those who passed through his hands will in their turn pass on the tradition of the only form of Japanese folk music that can still be said in any meaningful way to be alive. After the death of the legendary TAKAHASHI Chikuzan 高橋竹山 in 1998, Yamada was also the last remaining link to the days of the troupes of itinerant musicians who followed the seasons in order to make a living. SASAMORI Takefusa 笹森建英 (ST) and James Westerhoven (JW) decided to interview him about his life on the road, his ideas about the origin of the Tsugaru shamisen, and his hopes for its future. It is 3PM on Saturday, May 31, 2003, in Yamada's living room just across the street from Hirosaki University. He is seated comfortably on the sofa and looks well, in spite of the illness he is battling. The main difference with his usual appearance is that he is not wearing his dark-coated glasses and instead of his trademark long wig is wearing a knitted skullcap. His eyes are alert and his voice is much stronger than the interviewers had expected.